If you believe that only fresh and natural meat is worth putting on the table, you share the philosophy that guided the creation of this list. Whether you are always in the mood for a juicy steak, often crave succulent chicken wings that stick to your fingers or like your meat to be wild and full of flavor, our selection is sure to suit your taste and desires. We proudly present our ultimate list of the best meat delivery services in all of America. US Wellness Meats brings you all-natural, grass-fed meat of all sorts, from beef and bison to chicken and rabbit. It specializes in hard-to-come-by meat products and boasts jaw-dropping variety. 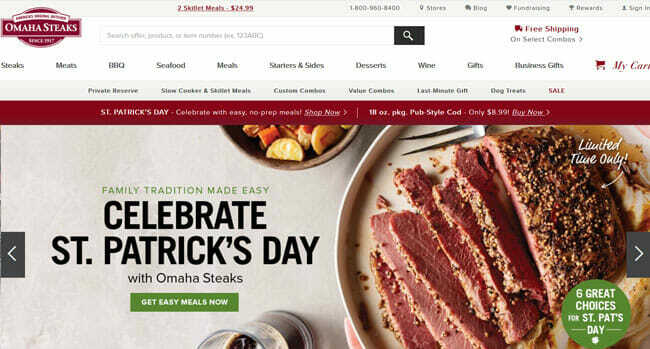 Omaha Steaks brings luxurious steaks, fine wine, ready-to-cook and chef-crafted meals, appetizers, and lovely desserts straight to your kitchen, all at rather fair prices, with no commitments. ButcherBox is a meat delivery service that specializes in natural, healthy beef, chicken, and pork, all humanely raised on family-run farms and free from growth hormones and antibiotics. Chicago Steak Company is a meat delivery service that offers hand-selected, hand-cut, dry- and wet-aged USDA Choice and USDA Prime steaks. Order commitment-free and choose from 100+ tasty items. Snake River Farms is a meat delivery service offering beef and pork cuts that exceed the highest standards of quality. Shop at your leisure with no minimum order and enjoy the finest beef and pork. Greensbury is an organic meat delivery that offers delicious grass-fed beef and bison, pasture-raised pork and lamb, free-range chicken, duck, and turkey, and gorgeous wild-caught seafood. Meat The Butchers is a top-notch delivery service specializing in premium meats. It offers everything from USDA Prime beef to wild, line-caught seafood. Opt for a subscription or one-time orders. Crowd Cow offers farm-fresh, pasture-raised, dry-aged beef, Wagyu beef, heritage pork, and chicken, with over 100 superior-quality cuts available at all times. Browse and shop at your leisure. Kansas City Steaks brings you the most popular beef, lamb, and pork cuts, as well as delicious poultry, seafood, and gourmet meals. Purchase anything you wish with no minimum order. Moink is a subscription-based meat delivery that brings you 100% grass-fed beef and lamb, pastured chicken and pork, and wild-caught seafood. Choose from 4 box types and customize your order to your taste. If you are a passionate carnivore, you are probably painfully aware of the fact that the meat sold in most stores is simply no good. It may be readily available, but it is stale, it is far from healthy, it lacks texture, and it does not taste the way it should. On the opposite side of the spectrum is getting meat straight from farmers, ranchers, and hunters. This is the ideal solution in terms of freshness and quality, but it is a luxury not everyone gets to enjoy. Plus, it usually requires more effort than many are willing to invest. Fortunately, these are not your only 2 options. Meat delivery services were designed as a clever way out of this troubling convenience-or-quality dilemma. They act as useful middlemen that connect meat lovers with trusted sources of fresh, properly grown meat. They make the whole process as simple as browse, choose, and have it delivered. Comfort of knowing where your meat comes from. In other words, you no longer have to search long and wide to find a good butcher and waste time and gas money. You do not have to settle for just a few standard cuts that you may have already grown tired of. You do not have to question the freshness and origin of the meat. Finally, you do not have to worry about the potential health risks associated with consuming stale meat of poor quality. With a reliable meat delivery, you can have farm-fresh, top-quality, sustainably grown meat delivered to your doorstep whenever you need it. You can order anything from duck to elk and from filet mignon to tallow. Whichever cut or product you are interested in, you can have it delivered to your home in just a few clicks and you can get as much of it as you wish. Of course, not all meat delivery services are worth your trust. Some may just be looking to make a quick buck, delivering mass-produced meat coated in false advertising, underestimating the customer’s ability to tell the difference between a premium product and a cheap alternative. Others may charge too much for the convenience or make you order more than you can eat in a year. Still, there are some truly attention-worthy services that do their best to exceed your expectations. The best meat delivery services provide pasture-raised meat, often aged to perfection, and deliver it straight from the source to your kitchen. They cooperate with the finest family-owned farms that employ the best sustainability practices. They provide unparalleled variety while adhering to the highest standards of quality and freshness. They set prices that are reasonable and justified by the quality of their products. They treat their customers with respect, provide efficient service, and do not force their patrons to order more meat than they want and need. Finally, the best meat delivery services represent the equivalent of having a farmer friend who saves all the best goods for you. They often deliver more than just amazing meat, letting you enjoy wild-caught seafood when you are in the mood for it or order farm-fresh products like dairy and broths that taste better than anything you can pick up from the supermarket shelf. They are interested in providing ultimate satisfaction, not just turning a profit, and that is what truly separates them from the rest of the lot. A meat delivery service that works perfectly for one meat lover may not be a great fit for another. Still, there are a couple of key characteristics that are highly indicative of a meat delivery’s ability to satisfy the needs of most. When deciding which meat delivery services deserve to be featured on our top list, we apply six main criteria, including meat quality, meat selection, the availability of extras, the company’s sourcing practices, flexibility, and pricing. We expect our top picks to exclusively offer the highest-quality meat that was grown in partnership with nature, in optimal conditions, without the use of artificial substances. We give preference to grass-fed and grass-finished meat, but we do not discriminate against high-grade grain-fed meats, which come with some fine inherent qualities of their own. We make sure that the products are freshly chilled or flash frozen, so the meat that reaches your home is both flavorful and nutritious. We are big fans of being spoilt for choice, which is why our top-rated meat deliveries have vast selections and do not focus on just one type of meat or a few of the most popular cuts. They offer both domestic and game meat, they offer both budget and luxury cuts, and they usually deliver everything from the most prized steaks to liver. While we primarily focus on meat, we do like companies that bring something extra to the table. Whether it is healthy seafood, farm-fresh butter and cheese, a nice sauce or seasoning mix that goes well with the meat or anything else that can improve your home dining experience, it brings bonus points that differentiate good meat delivery services from the absolute best. Since not all high-quality meat is the same, we pay close attention to the companies’ sourcing practices. Services that deliver meat from local, family-owned farms are preferred and only those that specialize in sustainable products are taken into consideration. The sourcing practices influence both the freshness and the excellence of the meat, which is why they represent a crucial factor in our selection process. The best meat delivery services are always flexible. If they have a minimum order, it is not too high. If they offer subscriptions, they are easily paused or canceled. The products are available in packs of various sizes, so you do not have to buy 10 pounds if you need just 6 ounces. In short, these services allow you to decide on the quantity and variety of products in your order and let you choose the delivery frequency that suits your needs. In the last step of our selection process, we examine the prices. We do not expect the top-quality meat products to be cheap, but we want them to be reasonably priced, with plenty of items for virtually every budget. We also pay attention to additional charges, like shipping and handling fees, making sure that they are not cost-prohibitive. It is time to get to know our top picks a bit better. In the mini-reviews below, we will focus on the basic characteristics of all the best meat delivery services on our list and highlight the qualities that make them unique. Find out how well they suit your expectations and choose the one that is just right for you. US Wellness Meats is definitely one of the best meat delivery services in the country, boasting an impressive, all-natural offer including flash-frozen and freshly chilled grass-fed beef, lamb, bison, heritage pork, wild-caught seafood, poultry, organs, fats, bones, broth, dairy, produce, nutraceuticals, healthy snacks, and even pet food. In addition to popular items like steaks and chops, it offers less common products like tallow, suet, and pemmican. Its pricing is fair, shipping is free (although handling is not), and it lets you shop as often as you wish, subscription-free, with the only limitation being the minimum order of $75 and 7 pounds of weight. Omaha Steaks is a meat delivery that has been around for more than 100 years and it is still one of the best in the business. It offers naturally raised, naturally aged, premium-quality beef, bison, veal, lamb, pork, and poultry, as well as a variety of seafood items, tasty meals, appetizers, sides, desserts, and fine wines to pair with the delicious food. Ordering is commitment-free, there is no minimum order, the prices fit most budgets, and the company offers a 100% satisfaction guarantee on all orders. ButcherBox offers flexible meat subscriptions that allow you to get the finest cuts of grass-fed and grass-finished beef, heritage pork, and pasture-raised and free-range organic chicken. There are over 60 items on offer and you can choose what goes into your monthly delivery or let the experts handpick the products for you. You get to decide on the quantity of meat in your orders, you can pause or cancel your subscription at any time, and shipping is always free. Chicago Steak Company lets you choose from over a hundred delicious items including steaks, steak burgers, chicken, pork, ribs, roasts, ham, surf & turf, fresh fish, and decadent desserts. Its main product is USDA Prime and Wagyu, dry-aged and wet-aged beef. You can order at your leisure or you can opt for recurring deliveries with one of its steak gift clubs. There is no minimum order and steak club membership allows you to enjoy free shipping. Snake River Farms brings you the finest pork and beef featured on the menus of Michelin-starred restaurants around America. 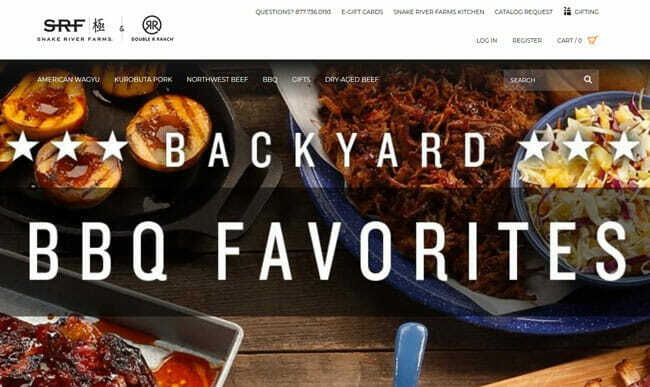 It has more than 150 items in its offer, primarily including American Wagyu, Northwest, and dry-aged beef, Kurobuta pork, and various mouthwatering BBQ cuts. You can order whenever and whatever you like, there are no commitments or minimum orders, the prices are pretty good considering the quality, and everything you purchase comes with a happiness guarantee. Greensbury brings certified organic meat and wild-caught finfish and shellfish straight to your kitchen. You can purchase items individually or in packs. You can opt for one-time orders or a subscription you can build yourself. In other words, when it comes to ordering, you are the boss. Greensbury’s world-class vegetarian-fed beef, bison, pork, and lamb are must-tries for passionate carnivores and its poultry and seafood are definitely worth the cash. Subscribe to your favorites and enjoy 5% off every order. Meat The Butchers is a meat delivery service that specializes in sustainably sourced, hand-cut meat and wild-caught seafood. You can order commitment-free and get free-range chicken, grass-fed and grass-finished beef, lamb, and pork, sushi-grade seafood, and more at its online store that includes over 70 top-quality items. The items come in packs ranging from 8 ounces to 8 pounds and you can order as many of them as you wish, with no minimum limit. Shipping is free on larger orders. 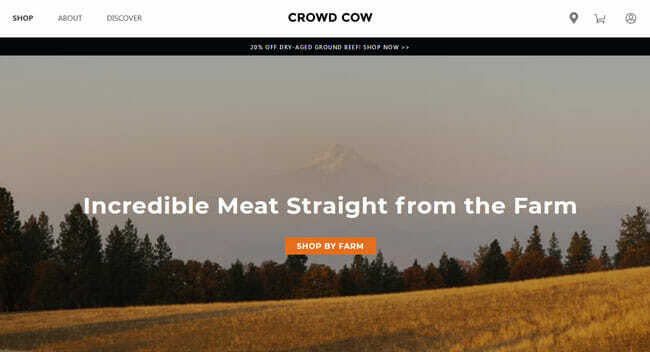 Crowd Cow is a popular meat delivery with an entirely unique concept. It sells one cow at a time to ensure maximum freshness, allowing each customer to claim a share of choice, no matter how big or small. It specializes in pasture-raised, dry-aged beef but also offers pasture-raised pork and chicken, all sourced from family-owned farms. There are 100+ items on offer and you can order anything you wish subscription-free. If you are interested in regular deliveries, you can get a pasture-raised ground meat subscription. With Kansas City Steaks, premium-quality beef, pork, lamb, chicken, turkey, seafood, meals, sides, desserts, appetizers, and meaty gifts for various occasions are all just a click away. The company’s offer includes more than 100 different cuts and bites and they can all be purchased with no obligations or limitations. If you want to have delicious steaks delivered on a regular basis, you can join one of the company’s money-saving monthly gift clubs. All products come with a satisfaction guarantee. Moink is a subscription-based meat delivery that specializes in ethically sourced meat but also provides exceptional wild-caught seafood. It allows you to choose from 4 subscription types, all fully customizable. You can get deliveries from Moink every 3-6 weeks and decide on the products you want to receive. The options include grass-fed beef and lamb, pasture-raised pork, all-natural, antibiotic-free chicken, and freshly caught seafood. The subscriptions are flexible, shipping is free, and there is a satisfaction guarantee.